The NAFSA Cuba Engagement Initiative focuses on creating sustainable partnerships between U.S. and Cuban academic institutions. The initiative builds on NAFSA's longstanding focus on Latin America and Cuba and redoubles NAFSA’s commitment to the use of academic exchanges and partnerships to build a more globally engaged U.S. and develop new opportunities for international higher education leaders to collaborate. The NAFSA Cuba Engagement Initiative includes the Cuba-U.S. Higher Education Dialogue Project and the Educators for Cuba Campaign. Educational leaders, experts, professors, and students from around the world will explore issues of partnership, diversity, and international education on the campus of La Universidad de Cienfuegos and at historic locations around the city. NAFSA members are eligible for a 10 percent registration discount. Relations between the United States and Cuba are constantly changing. Join this online community on Network NAFSA to stay up-to-date on news, access resources, share your experiences, and more. To join the community, you must have a NAFSA Passport username and password. Create a free NAFSA Passport here. The following 178 institutions are members of the NAFSA Cuba Engagement online community. Representatives from the University of Cienfuegos speak about higher education opportunities at their institution and between Cuba and the United States at the NAFSA 2016 Annual Conference & Expo in Denver, Colorado. Targeting advocacy work to urge the U.S. Congress to ease travel restrictions and lift the economic embargo on Cuba. Pushing for transparent, efficient visa processing for Cuban travel to the United States. Convening higher education leaders and like-minded partners including American Association of State Colleges and Universities (AASCU), Civitas Global Educational Services, Engage Cuba, the Latin America Working Group (LAWG), and the Washington Office on Latin America (WOLA) to mobilize support. 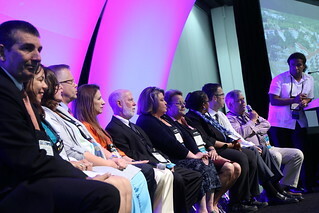 Higher education leaders are supported by NAFSA’s public policy team with legislative updates; access to coalition efforts with local education, agriculture, and business leaders; and advocacy opportunities to connect with and educate members of Congress on Cuba and the value of international education.